SOMETIMES GOVERNMENT just makes bad decisions. The landmark B.C. 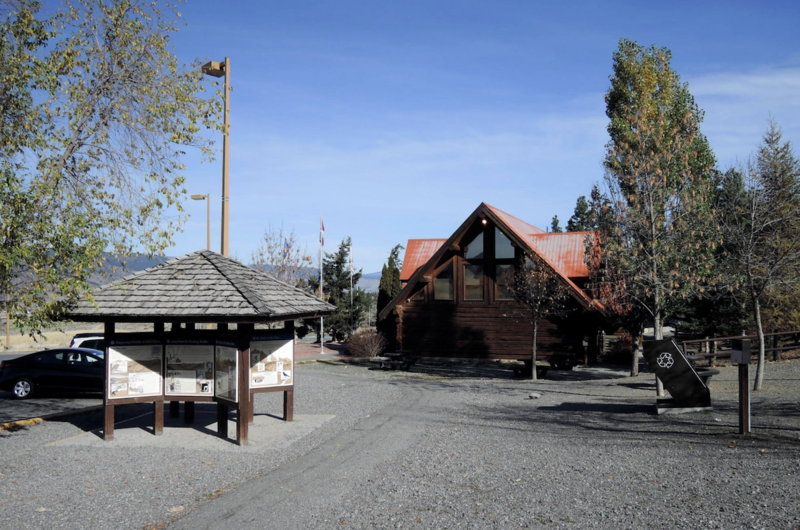 Visitor Centre at the junction of the Coquihalla Highway and the Okanagan Connector was shut down in January, leaving the City of Merritt to take up the slack as best it can. On Canada Day, the City unveiled a new mobile tourism information trailer as part of its efforts to fill the gap. The trailer was paid for with a grant from Destination BC, the same Crown corporation that shut down the information centre at exit 286. Merritt also continues with its information booth at Baillie House in downtown Merritt, and has a Tourism Ambassador program. That’s called stepping up. However, none of that can replace the visitor centre out on the highway that for many years provided a place for tourists to take a break from driving, hit the washrooms, get a snack and some information. The rationale is that the visitor centre needed expensive upgrading and visitor numbers were down. Sure, that’s the effect of social media. Here’s what I think the provincial tourism people are missing. Local tourism is intricately tied in with regional tourism. Tourists don’t draw boundaries. They judge their experience by the enjoyment of the trip, the sites they see and the service they receive. The Exit 286 centre catered to that overall experience. If we want to encourage tourism, we have to think in terms of integration of the whole. Dumping it onto the shoulders of local communities for the sake of saving some bucks is false economy. That visitor centre should be renovated and re-opened. Ok…. why don’t you organize the funding for it. Maybe you’d like to pay for it….. No…? Oh I see, don’t take it out of your pocket book, but feel free to spend other people’s tax dollars. Ha, typical left liberal. I drive that section of road several times a day. I have never seen more than one vehicle in there. Highway maintenance and the RCMP use that turn around more than any tourist. The Wal-Mart parking lot gets more tourists activity..
Maybe the reason you see so few vehicles there is that it has been closed? Actually, I had a job in Merritt last week and I had an hour to kill so I decided to go park at the old tourist office. There were at least 20 vehicles there at any given moment. Probably 50 vehicles came and went during the hour I was there. People were walking around stretching their legs. Others had packed picnics and were enjoying the fine summer day while they ate lunch. Some were wandering off into the forest, likely looking for a secluded spot to relieve themselves. Basically, the place was hopping. I agree with Mel. Get it fixed up and and get it open.